Following a lament by Urjit Patel, the head of the Reserve Bank of India, who three months ago predicted (correctly) that the Fed's tightening coupled with the shrinking of its balance sheet and the ramp up in Treasury issuance would result in a dollar liquidity shortage and that "a crisis in the rest of the dollar bond markets is inevitable" unless something changed, we showed how shrinking liquidity as a result of Quantitative Tightening had emerged as the main culprit for the turmoil and "rolling bear markets" that have hit the rest of the world, courtesy of the following chart from Nedbank. 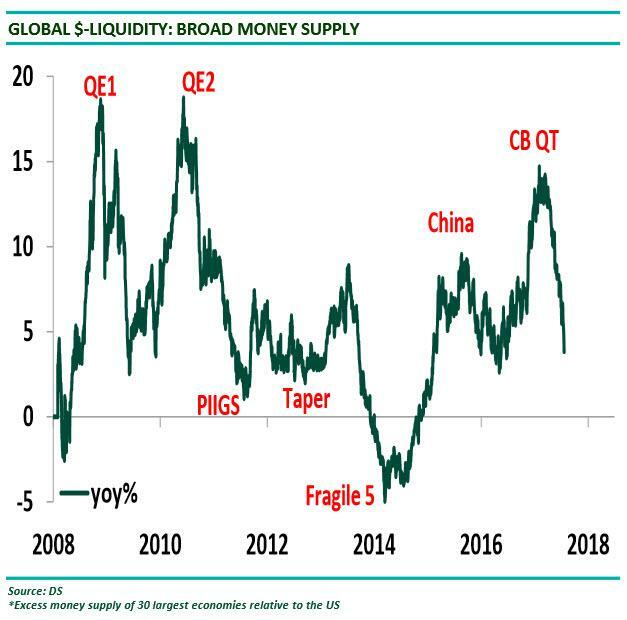 Picking up on the topic of shrinking dollar liquidity and broad money supply, BofA's Barnaby Martin today notes that much more pain is in store as the Fed’s withdrawal of the punchbowl looks to be far from over; in fact, the Fed’s balance sheet declined by a significant €60bn in August, the biggest monthly decline seen yet in this tightening cycle, adding that last Friday’s healthy US wage growth data will only support the Fed’s resolve to push on with monetary policy normalization. More importantly, Martin observes that the Fed's QT (Quantitative Tightening) "is having the effect of pulling global capital out of those pockets of the economy that were the big beneficiaries of the post-GFC reach for yield" such as Emerging Markets and, of course, stock markets around the world. 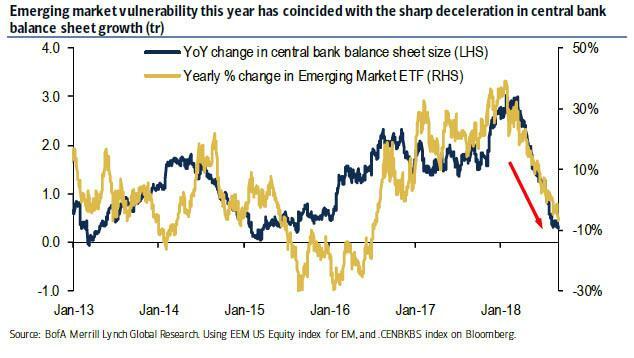 And in what may be the best chart showing the culprit behind the recent EM turmoil, the BofA strategist shows that this year’s Emerging Market vulnerability has coincided with the sharp deceleration in central bank balance sheet growth. This in turn has led to the biggest ever differential in Emerging Market vs G-10 currency vol as EM traders have been scrambling to avoid getting burned by the rising price of the dollar. Here, Martin introduces a new concept to explain the growing routs across global markets as dollar become increasingly more scarce: "race to the top." In the initial years after the Lehman event, central banks were primarily focused on staving-off the threat of deflation via huge monetary loosening. This created a “race to the bottom” in global interest rates as currency weakness would help central banks achieve their aims. Today, howewer, the tables have turned, as a result of the Fed's tightening campaign which may push the US fed funds rate to 3% or more, and the risk of capital flight - into US assets - is provoking a “race to the top”, of sorts, in interest rates. Here Martin makes a sobering observations: "over the last 6 months, the cumulative number of interest rate hikes across the globe is almost on par with that seen just prior to the Lehman event." This, of course, is a problem for most countries as higher rates mean slower economic growth and capital outflows. And emerging markets are, of course, leading this rate hiking charge. Indeed, stemming the capital flight, after years of QE-induced inflows, requires some "eye-watering interest rate hikes" - such as the recent 40% rate hike from Argentina. 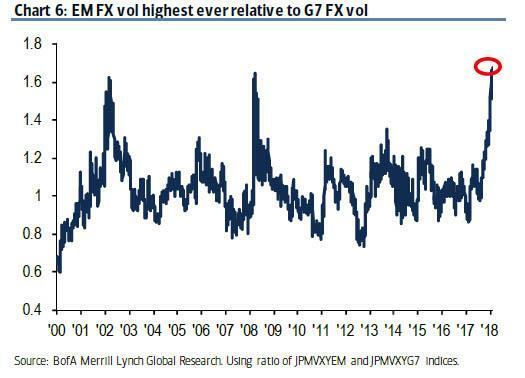 This, in turn, has led to the ratio of EM FX volatility to G7 FX volatility to jump to an all-time high (as shown above). Anticipating more central banks joining this “race to the top” in rates, markets have responded sending Russian 10yr sovereign debt yields above the yields on South Africa’s sovereign debt, with both now yielding north of 9%. Firstly, with the ECB having pledged not to touch interest rates until at least next summer, higher rates elsewhere simply creates more “competing” asset classes for European credit. In EM for instance, positive real interest rates make the 1% nominal yield on European high-grade credit look very meager now (chart 8). Secondly, extreme EM FX volatility becomes a fundamental issue for a number of European companies. As chart 10 shows, Europe is a relatively open economy and many European companies have become a lot more global over the last decade, increasing their reliance on emerging market revenues. 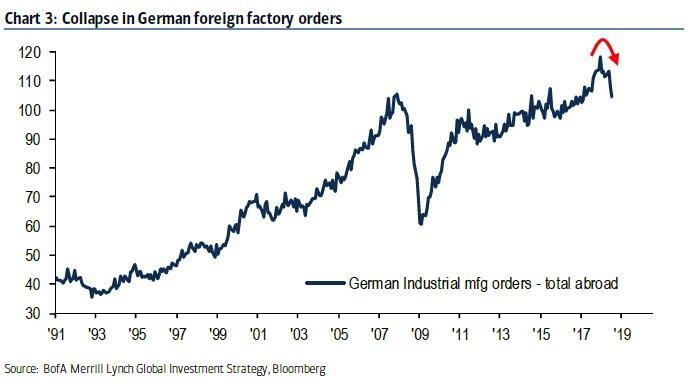 Last week, BofA's Michael Hartnett made a similar point, noting that just as Japan was the catalyst for the 1998 Asian crisis, so Europe will be the spark that makes the current EM turmoil into a global crisis, and as direct evidence he showed the recent collapse in German foreign factory orders, an indication of how hard EMs have been hit in recent months, and that it is only a matter of time before Europe's export powerhouse suffers too. Validating this point, it is hardly a surprise that while the correlation of US equity markets to EM equities remains negative at present, the correlation between European equities and EM equities has been significantly positive over the last few months. Extending this line of thinking, with the Fed unlikely to stop hiking any time soon - especially not with a record number of job openings and US workers quitting the jobs just as wages accelerate to the upside - the next casualty of the Fed-inspired dollar liquidity shortage will be Europe, at which point the EM crisis will finally break into the "developed" market. At that point it will have no choice but to jump the Atlantic and finally affect both the US economy and stock market, both of which have shown remarkable resilience to the world's rolling bear markets and emerging market turmoil.